To kick off our series on Super Talent flash drives, we will first showcase what’s probably the most elegant and capable model. The aptly named Luxio. - Compatibility with USB 1.0 and 2.0. - LED indicator for power and activity. - Hot plug & play. - A data retention of more than 10 years. - The design of wood grain, silver or black. - The capacities of 16, 32, 64 and 128GB. - Support for password protection and ReadyBoost. - Erases data after five failed password attempts. - The economic size of 21 x 76.50 x 9.50 mm. - A neat leather carrying case. 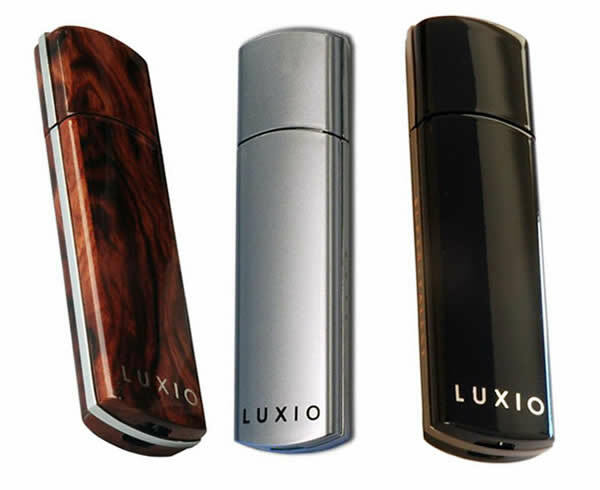 What makes Luxio flash drives really special though is the 256-bit advanced encryption standard (AES-256) and their fast transfer rate. Operating with a dual channel flash memory, the reading speed is 30MB/sec (200x) while the writing speed is 16MB/sec. Talk about swiftness! So if you ask me, these memory sticks definitely have the makings of a super talent and justify their hint of luxury. Don’t you agree? p.s. : I actually used to think that Luxio was the manufacturer and SuperTalent the specific brand product. But as you can see, it’s actually the other way around. So don’t feel bad if you made the same mistake…now you know better! what made you come up with the name Luxio? You have to ask Super Talent that, not me. As of June 2011, this blog no longer allows links with dofollow or commentluv due to Google's new "Panda" algorithm. I'm truly sorry about this! Design: NT Marketing, Spielzeug. Code: Fototapete Bambus, Brautmode.